Dosa is a South Indian Dish, most of the time made with rice. 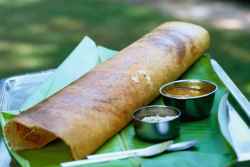 I have tried to add my recipes of different types of Indian Dosas like Masala Dosa, Paneer Dosa, Rava Dosa, Onion Dosa, Oats Dosa and many more. Some dosa Recipes are instant and quick to make like Crispy Dosa. My best dosa is Indian Masala Dosa which is also very easy to make.